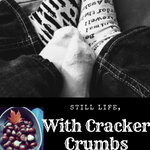 April | 2018 | Still Life, With Cracker Crumbs.. The weather was, for the most part, glorious this weekend, with the exception of Saturday morning. It was gray, cold, rainy and damp. It was awful. Billy went to the movies and left Wyatt and I to our own devices. And my devices believed we needed scones. I am not a person who bakes a lot, but my grandma baked all the time, everyday almost. And she was so good at it, turning out delicious pies, crumbly jammy tarts, cookies, and scones, just to name some of her specialties. I have never made scones myself, but I have eaten plenty over the years, and I spent much of my time growing up watching my grandma and then my mom make pastry. I felt slightly prepared, and the recipe looked pretty simple. I used a recipe online, I need to find my grandma’s for next time, although this one was very similar to hers. And they turned out awesome, if I do say so myself. Wyatt and I nibbled on those for a bit then later we took little man for ice cream, because it was a beautiful afternoon compared to the morning, and ice cream was required. And swinging on swings in the park, which we also did. This kid takes his ice cream seriously. On Sunday we went to a vintage bike swap meet, where there were literally hundreds of old bikes. It felt so much nostalgic and buddy movie, like The Goonies or Now and Then or Stranger Things. There were many, many sparkly banana seats, banana seats with stripes, road bikes, dirt bikes, old bikes – like super old. There was an old Schwinn cycle truck, with a gigantic basket. And the cutest little kid bikes ever. We don’t know if that is something that Wyatt will ever be able to do with his Cerebral Palsy, but you never know. We will just keep working hard, and maybe one day. If not, there are plenty of amazing adaptive bikes out there too, even bikes that are designed for someone to ride and someone to do the pedaling. So, there are many options. I also loved all the different names of the bikes – I am not a bike person, so I don’t know all the terms. My husband does, he is a bike fanatic. So I will just call them the names. There were so many different ones! The Meteor, Stingray, Stardust, Phantom, Hornet. It was my favorite part, I think reading all these different names and kinds. We also saw tandem bikes, and unicycles, and really old bikes, like Penny Farthings. The sun was gleaming and shining like crazy off all the chrome and it was just a beautiful day, with the sun finally shining. We had a great time. And seriously, isn’t that Lil’ Tiger adorable!!! The woman selling it told me that her son learned to ride a bike using that bike. And I love the addition of the training wheels and bat. So darn cute! Back to the same old routine today – preschool, cleaning, work. Blah. But at least the sun is still shining and we had a great weekend. You can always look back on a happy memory for a pick me up! Let’s Begin the Season of Flea Markets! I always joke with my friends that I don’t know how anyone finds anything at flea markets or garage sales or rummage sales. When it comes to that, I have no eye. I walk around and see things all spread out willy-nilly on a table and think “this is all just trash!”. Lol. Now, I know this is not the case. I am just not good at seeing things apparently for what they could be. My friend Kelly however is a mad genius of taste and decorating. Seriously. Her home is beautiful, like something out of a magazine despite having a two year old. One day I will do a series on her house maybe – it deserves to be talked about. She has an innate ability to know what will look good where, what colors to use, and of course finding treasure at flea markets. We are entering the season of these sales in our area, and we are all excited to start going. I love them, despite my innate inability to visualize new homes and lives for the things that people are selling. I am a curious sort of person, I like to see what people once liked. But this year, I am challenging myself to look beyond, and to see what an object could be. I am sure most of the time I will fail. But, I have been studying magazines like Country Living and HGTV for ideas, and to read about what other people do. And I asked Kelly what her magical secret is, other than it being her own natural creative talent. She told me I need to go in with an idea already, something I am already looking for. Like art for a specific wall, or a piece of furniture I need, or just a little something extra, but to have a plan. So this morning Billy and I popped in spontaneously to a church rummage sale. I didn’t have a plan, but I did have an idea. We are redoing my office, and my “theme” is Michigan artists and writers – even if it was just for a brief time, like Ernest Hemingway. It was inspired by a postcard I found of the artists colony in Saugatuck in the 1920s, and I am pretty excited about it. So while we were poking around, I spotted something in a box on the floor under the table and was rewarded for my eagle eye nosiness. A vintage calendar of block prints by Gwen Frostic! I was so excited. Gwen Frostic is a Michigan artist and poet. She even graduated from the same high school as I did! She moved north to Benzonia, just a few miles from where our family vacations every summer. And she loves nature, just like me. So I was super excited about my discovery! I couldn’t wait to show Kelly and Chrissy, who both validated my instinct. We also picked up a bunch of other stuff – it was fill a bag for $1.00, so we threw more stuff inside. I added a small green Pyrex bowl for Chrissy, who has a collection. A grey cardigan that looks perfect for winter days writing or reading or exploring. A slate tile with a fox engraved in it from Wales (Trallong, Brecon). Billy added a small silver frying pan, an old fashioned ice cream scoop, some weird little silver pans that he said are used to poach eggs, and also an 80s era light blue Camaro t-shirt for me. Wyatt’s contribution to the bag was a roll of Christmas ribbon with Nutcrackers on it – we aren’t sure why, but hey, if he wanted it. He does love the Nutcracker episode of Daniel Tiger, so maybe he did know what they were. And then finally, an oval box with Christmas trees. That was a random pick up as we were walking to check out. My husband noticed too, that the calendar from 1979 actually matches date and day for our current year – weird! So I can actually use it this year and then frame it at the end of the year. So a pretty random assortment, but I feel like I got at least two or three pretty cool items! I am looking forward to what else we find this year. What’s the coolest thing you have found at a flea market or rummage sale/garage sale? Michigan is still waiting for spring, it seems. Sometimes we get a sneak peek, but then it hides away again. Today is sunny – but also 24 degrees. I have strawberry plants that have arrived and want to be planted, but the ground is still frozen! For now they are living in the house, but I am going to have to come up with a new plan for these guys, my awesome Viking strawberries. Yesterday was sunny and mild except for the crazy wind. The wind was biting cold when it slammed against you, but when it wasn’t stealing your breath, the day was actually not too bad. Our family celebrated the return of the sun to our area by heading downtown to Belle Isle and visiting the aquarium and conservatory, where we not only got the sun, but we also had humid temperatures, tropical plants, heat. It was wonderful, despite the fact that we were dressed for winter but walking through a greenhouse. It was jam packed there – I am guessing everyone in the whole metro area was out enjoying the weather. We have had gray skies for too long! This whole state has a Vitamin D deficiency, as we wait for spring. The garden was beautiful, full of green growing plants, smelling of earth and warmth. We saw a banana tree, a lemon tree, an orange tree, a pomelo tree. Cacti. A ginger plant, pink puffballs. Giant leaves bigger than Wyatt, delicate fronds, wispy ferns. A water fountain. Even signs that a cat lives there somewhere, but not the cat itself, although I would have loved that, and Wyatt would have too. He loves his kitties. It was a nice day, that we ended with pizza slices from Supino’s, which has the most amazing pizza ever. It was Wyatt’s first time eating there, and he kept asking for more. Another fan is made. We stuck with the basics but I love their pizza with basil – I love basil anything. The slices are huge, thin crusted, so you can just fold them over and eat. But there is something about the crust, some taste, some deliciousness we can’t put our finger on – that is where the magic is. In that crust. We had a car picnic so I didn’t get any photos, but next time I will. I feel inspired! This week we are going to start seeds indoors. Normally it would be too late, but with this delayed spring I think we should be ok.
How about you guys? Any thing in particular you like on pizza? Are you a thin crust person or a thick crust person?